Somehow seafood always seems perfect for a romantic dinner. Make a delicious Valentine’s dinner at home and skip the inflated restaurant prices. You can throw this seafood dish in the oven after just 7 minutes prep time and have a wonderful dinner. Frozen scallops are lots cheaper than fresh scallops, and frozen ones work fine in this recipe. Just thaw the bag of scallops in cold water for about 30 minutes and they will be ready to use. You can get the rest of the ingredients ready, possibly make a salad, and set the table during that time. This is a bit unusual in that the scallops are baked, but they come out perfect every time. And as they bake you can make a simple salad. 1. Dry the scallops well with paper towels. 2. Melt the butter with the garlic added in a casserole dish in the oven for 2-3 minutes. Do not add the bread crumbs to the butter because the crumbs will clump. 3. 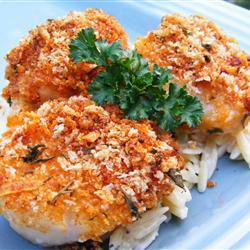 Make the bread crumb mixture using panko bread crumbs, the Parmesan cheese (optional) and the spices in a bowl. Several reviewers said the Parmesan does not taste right in this, so feel free to leave it out. 4. You can use Old Bay Seasoning instead of the spices listed in the recipe, if you like that flavor. It makes it quicker too. Add some red pepper flakes if you like your seafood spicy. 5. Roll the scallops in the melted butter, then roll them in the breadcrumb mixture. 6. Place the scallops in the casserole dish, but don’t let them touch the sides of the baking dish. 7. You can turn this into a seafood dinner by adding 1 to 1 1/2 pounds of medium to large peeled shrimp with the scallops and double the bread crumb mixture. This also brings down the cost per serving and might be more popular with children. 10. This is delicious on rice, pasta, or even a bed of spinach with some cherry tomatoes. Orzo is a pasta that cooks in about 5 minutes and looks very gourmet. We love it. Angel hair pasta also cooks very quickly if you prefer. If you want a cooked vegetable, broccoli, glazed carrots, corn, or sugar snap peas are all good. Light the candles and pour the wine. White wine is perfect with seafood. Fetzer Pinot Noir is surprisingly good for only $7 a bottle. These can also be used as classy appetizers with a less expensive meal or for entertaining. Leftovers are delicious, but reheat them in the oven or toaster oven. Do not reheat them in a microwave because that would make the bread crumb topping soggy. If you already have other plans for Valentine’s Day, keep this one in mind for any special occasion dinner, including an anniversary. Enjoy! Click here for recipe at AllRecipes. Or try this beautiful Salmon Avocado Salad. Arrange the ingredients on a plate to look artistic. Beautiful for Valentine’s Day or any time you want a beautiful presentation.